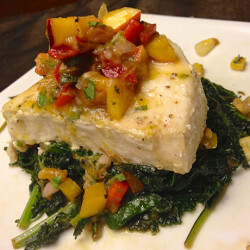 I mentioned last week that my sautéed kale and corn combo and luscious grilled peaches, while delightful on their own, were initial steps in the creation of a more elaborate dish. Yes, the day you’ve all been waiting for with bated breath is here at last on The Nutrition Doctor is In the Kitchen. Today I bring you a meal that’s elegant, beautiful, delicious—and nutritious.Nope, you needn’t leave your taste buds at the door when cooking and eating the PK Way: the key to healthy eating for life is creating fabulously tasty food that’s also good for you, right? And, not for nothing, this dish would work well with seared or grilled tofu for my non-fish eating and/or vegetarian readers. Enough of that, now. Let’s get cooking. 2. 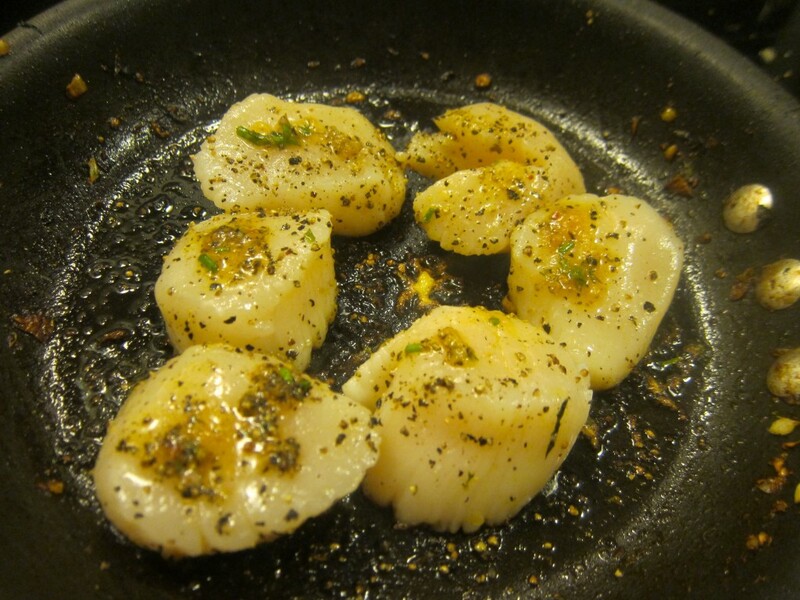 Season the scallops with freshly ground black pepper and a bit of kosher or sea salt. Feel free to spoon a bit of the vinaigrette over the scallops as well if you’re feeling frisky. 3. Sear in a hot, oiled pan 2-4 minutes (depending on thickness). 5. Arrange artfully. 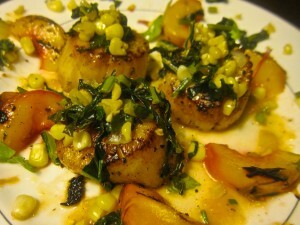 Drizzle the vinaigrette on the bottom of the plate, then place the grilled peaches on top and garnish each scallop with a bit of the kale/corn mixture. Low on the food chain, scallops are filter feeders that improve water quality and are a sustainable seafood choice, like oysters. (More here from the Monterey Bay Aquarium.) 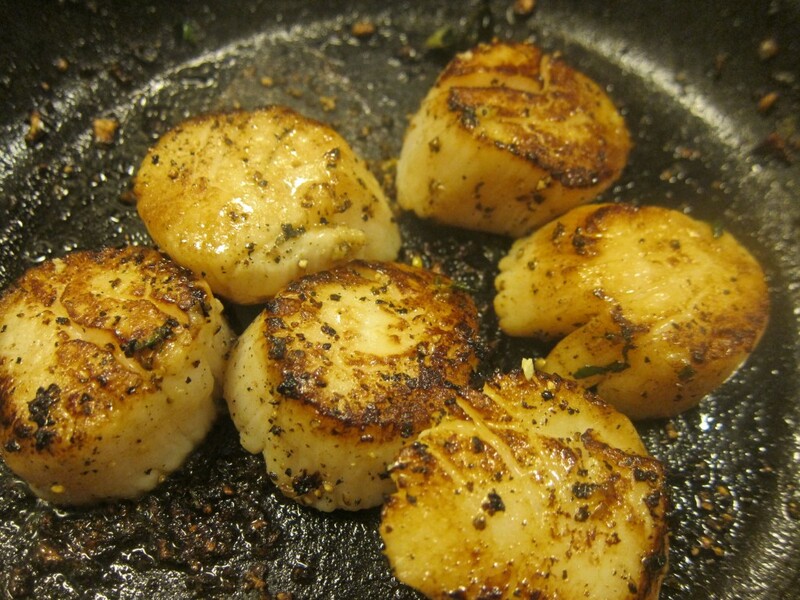 Scallops are mainly protein and contain essential minerals like calcium, magnesium, potassium, iron, phosphorous, zinc, and copper. A lean little bivalve, scallops don’t give you a whole lot of omega-3 fatty acids—those powerhouse polyunsaturated fats found in fatty fish that yield a wide array of health benefits—but they provide a bit. They’re a good source of vitamin B12, too, something many older Americans don’t get enough of in their diets. 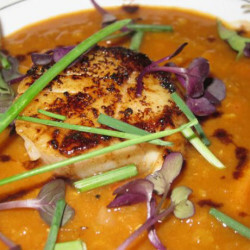 Scallops don’t have a lot of calories and combined with the rest of the high-fiber ingredients of this dish, this meal is actually quite low in total energy. (Dare I say fancy diet food?) But combined with a lovely little side salad I’ll bet you’ll be all set, especially if you learn to embrace the sagacity of the Japanese philosophy hara hachi bu. Anyhow, see how you’re brought in by the dish and then find how how great it is for you and the planet? 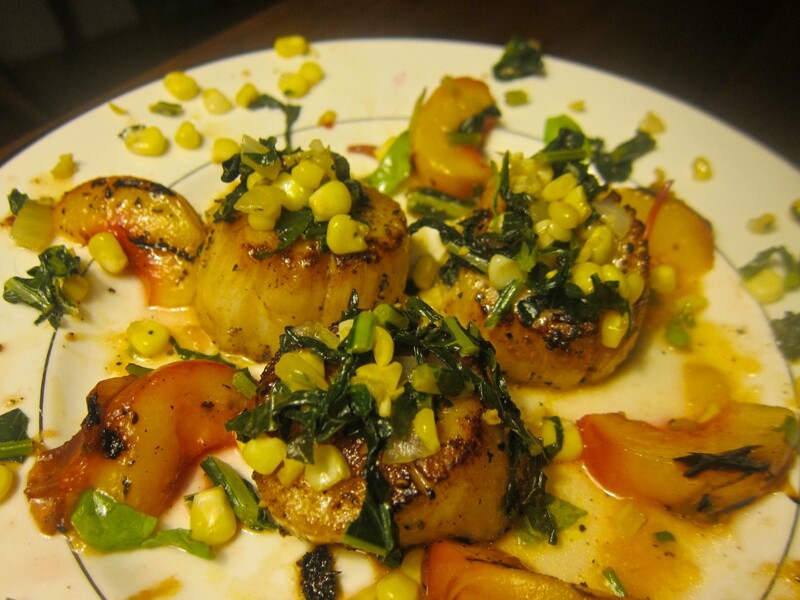 Not to mention that most of the ingredients came from my local farmers’ market, which means that the produce is at the peak of its freshness and flavor, creating the perfect complement to the scallops. Supports local businesses, too. This looks amazing! I have long been intimidated by cooking scallops (silly, I know) but your instructions sound so easy, I might just make it past my fear! Another winning recipe! Easy, just don’t overcook and you gotta season. I go for medium-rare, which will cook to almost medium once you get them on the plate (as fish continues to cook while it’s resting). They should give a little when you poke them. If they don’t, well, um, live and learn. And your daughter won’t mind if they’re overcooked, either ;). This is a great recipe for entertaining friends. 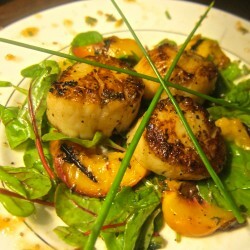 I especially like the peach vinaigrette, which seems like a great combination with the scallops. This was worth the wait! This looks fabulous, but I can’t find the recipe for the kale, corn mixture. Is it on the blog? I couldn’t find using search. Thank you! !